I am including this story in today’s news because I feel that it shows important ways in which the advancement of technology can aid humanity not only in learning about ourselves and our history, but in seeing our potential with the responsible use of said technology. A Canadian First World War soldier killed in action nearly a century ago can finally rest in peace following the identification of his remains and his burial last week in France. This resolution was possible due to a novel combination of identification disciplines, including that of Burlington, MA company Z Corporation’s  3D printing technology. Private Thomas Lawless of Calgary, Alberta, were discovered in 2003 at a construction site near Avion, France. He was killed in action on June 8, 1917, a few months after the Battle of Vimy Ridge. He was 28. Two sets of remains were found at the site. The first soldier was identified using DNA analysis in 2007. A combination of historical research, forensic anthropology (the study of the human skeleton), facial reconstruction and isotopic analysis yielded Lawless’ identification, as announced on February 24, 2011. The identification team created 3D computer models of Lawless’s skull, derived from CT scan data of several large skull fragments, in order to narrow the list of possible matches for the remains. Physical models of the skull were produced using a Z Corporation 3D printer, which creates physical composite models from scan data much as a document printer produces a business letter from a word-processing file. Using muscle markings on the skull model, scientific tissue-depth tables and plastilina modeling clay, the team worked with noted Canadian artist Christian Corbet  to construct a face on the model. They then photographed that face, and superimposed images of it on photographs of soldiers who were potential matches. By seeing how the images lined up – by face height, width and features such as jaw shape – the team was able to narrow the list of potential matches to two. An isotopic analysis of teeth and the jaw bone indicated that the recovered soldier grew up in Dublin – a direct biographical match with Lawless. To see photos of the rebuilding process, please visit Military Historian Jeremy Banning’s site , where he has posted the images with full permission of Christian Corbet. Private Thomas Lawless, born April 11, 1889, was a member of the 49th Battalion, Canadian Expeditionary Force and was buried March 15, 2011, at La Chaudiere Military Cemetery in Vimy, France, with his family in attendance. La Chaudiere, a Commonwealth War Graves Commission cemetery, currently has 907 servicemen from the First World War buried or commemorated there, including Canadian Private Herbert Peterson, the soldier found in 2003 with Private Lawless. Private Herbert Peterson was born on February 28, 1895, in Scranton, Kansas. 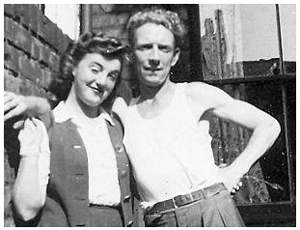 He and his five brothers were the offspring of Charles and Julia Peterson from Rose Lynn, Alberta. On February 22, 1916, just shy of his 21st birthday, Private Peterson joined the 137th Overseas Battalion, Canadian Expeditionary Force in Calgary as a private. On his attestation form, Private Peterson listed his (1916) address as Berry Creek, Alberta, and recorded that he was a farmer, single, Presbyterian, with no current or previous military service. During Private Peterson’s medical examination, he was noted as being five feet, nine inches tall, with a fully expanded chest measurement of thirty-nine inches, a fair complexion, blue eyes, and brown hair. He arrived in England with the 137th Battalion on August 30, 1916, and was formally transferred to the 49th Battalion, CEF, on December 7, 1916. A few weeks later, on January 20, 1917, he joined the 49th Battalion in France as a reinforcement soldier. He was declared missing after action on June 9, 1917. Until the recent discovery of his remains, Private Peterson was one of the more than 11,000 Canadian soldiers who died in France during the First World War and who have no known grave. 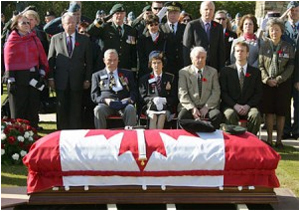 Private Herbert Peterson burial photo credit: from the blog of military historian Jeremy Banning . Nelson sees a variety of applications for 3D printing in anthropology beyond the identification of soldiers’ remains. For example, his team used Z Corporation 3D printing in the 2003 facial reconstruction of the Sulman Egyptian mummy  housed at the Chatham-Kent Museum  in Chatham, Ontario. The facial reconstruction of the mummy was also done by Christian Corbet.